If you are looking for an outdoor speaker for this summer then you want something proven to withstand the elements. iHome is a premier maker of such devices and is now announcing a new line that it claims is perfect for outdoor use. The Weather Tough line is being called "military grade" portable Bluetooth speakers. They were announced back in January at the Consumer Electronics Show, but are just hitting the market now. The company claims "Each iHome Weather Tough speaker will let users take their music where no other portable Bluetooth speakers dare go. 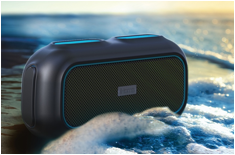 Featuring a completely waterproof design (IP67-rated), and tough military-spec rubberized shock-proof casing, all Weather Tough speakers can withstand drops, shock, dust, storms and even being submerged in water". There is the budget model IBT37, a speaker with an internal rechargeable battery that claims eight hours of battery life. It even has a tripod mount on the bottom. It retails for $39.99. The IBT82 claims 12 hours of battery life and costs $49.99. The IBT35 is $69.99 with eight hours of battery life, but it comes with an aux jack, carabiner clip and LED indicators. At the top-end is the IBT9, which is still reasonable at $99.99. It has a USB port to charge your devices, 2 full-range drivers and passive radiators for deep bass and claims 12 hours of playing time. All of these are available as of today at iHome.